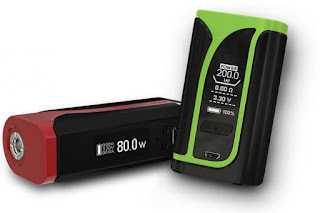 The iKuun i80 & iKuun i200 are both the newly-released kit by Eleaf. They are similar to some extent, but also distinct from each other in some aspects. Both of the kits are creatively designed in that they possess temperature controlling system which securely gets rid of the potential danger of overheat. Except for the adoption of the popular EC coils, they have an upgraded EC2 series coil for extraordinary vaping experience. Besides, these two kits support 2A quick charge capacity. And the whole kits are detachable which makes them easier to use and clean. The most distinct difference between iKuun i80 and iKuun i200 is that the former tends to be a little bit tinier. iKuun i80 presents a 0.91 inch screen, while iKuun i200 displays a 0.96 inch one. What's more, the former counts for only 175.5g (with MELO 4 D25)and 171g (with MELO 4 D22) respectively, whereas 198g (with MELO 4 D25) and 192.5g(with MELO 4 D22) for the latter. A bigger screen means clearer and conciser figures ,for it is presented in the of "%", allowing to remind the owner of the battery condition . While a smaller one makes the kit easier to carry. It all depends on your personal preferences. But here we promise, no matter which one exactly will you choose, you will definitely find it worthy of your cost. You can purchase both iKuun i80 and iKuun i200 from http://www.istick.org/.